Order just what you want, just when you want it. No strings, no commitment — just great tasting meats, eggs, and produce coming straight from our farm to your city. Please take a moment to review our policies below before proceeding to our online store at the bottom of the page. Browsing on an Android device? 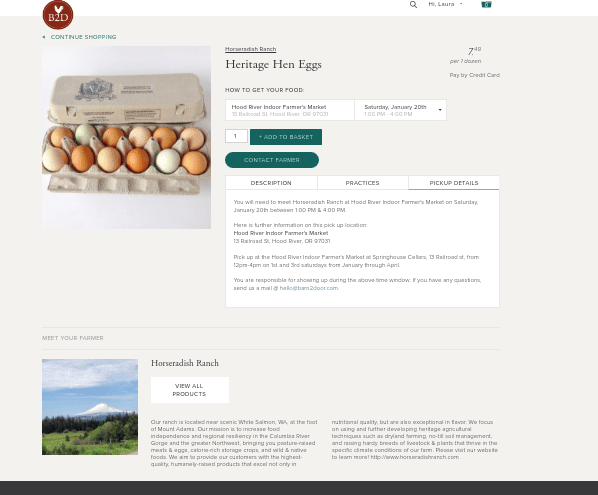 Download our farm’s app from the Google Play store for easy mobile shopping and information! 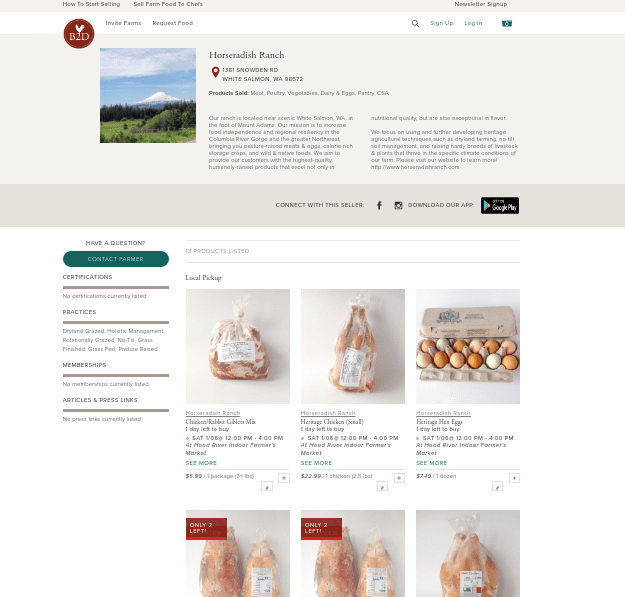 We sell meat, eggs, and produce to customers in the Columbia Gorge and Portland through an online platform called Barn2Door. When you are ready to start shopping, you’ll be directed to our online Barn2Door storefront. 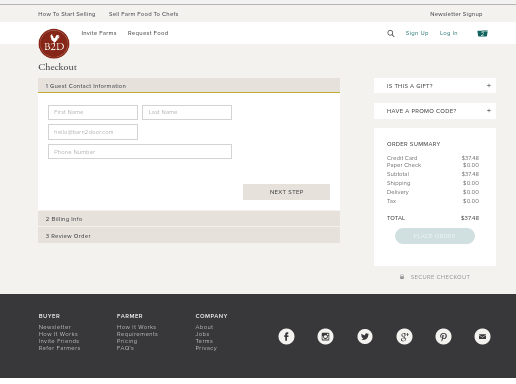 You have the option of creating an account if you want to save your information for future orders, or checking out as a guest for one-time orders. 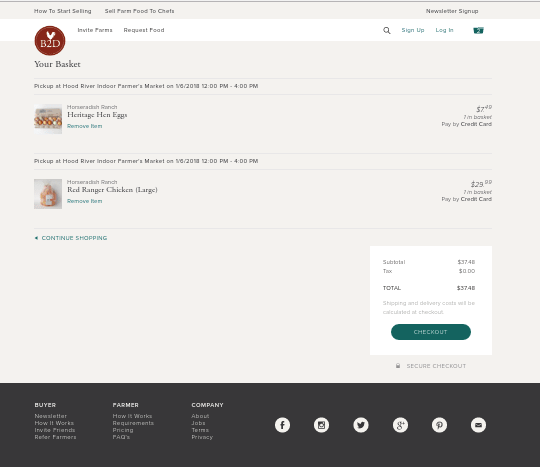 Items will be listed for Local Pickup, where you can pick up your order at a pre-determined location on a specific date within a wide time window listed in the product. We offer pickups at a variety of easy-to-access locations throughout the Gorge and Portland! Make note of the pickup day, time window, and location listed in the product so that you know when and where to find your order! Once you have selected a pickup time on the item page, make sure to read the instructions under the ‘pickup details’ tab (as pictured above), as instructions for each location can vary. If you have placed an order and wish to cancel it, please e-mail us at least 24 hrs prior to the day of delivery with your Name, the e-mail address used to place the order, and contents of the order you wish to cancel for a full refund. We cannot guarantee cancellation/refunds with less than 24 hrs notice. If you are unable to receive your order for any reason (e.g. can’t make it to your pickup on-time) on the day of delivery, please call or text us at (509)-310-3157 as soon as possible to let us know! Due to state laws regarding poultry processing, we have to split our inventory in order to serve both WA and OR state customers. Occasionally, this means we can be sold out of an item for residents of one state, but still have it available for residents of another. You may notice that an item lists pickup points for only one state — don’t worry, that just means we’re sold out temporarily in one state and it’ll be returning soon! Any products listed on our What we Sell page that are not in the Web Store aren’t necessarily unavailable! We often have items available at the Farmer’s Market, through the CSA, or for on-farm purchase that don’t quite fit in the web store if the package is a non-standard weight. You can e-mail us about special requests or wholesale orders. Whew! Way to be a champ and make it through all that fine print. Happy shopping! Please visit our FAQ or e-mail us if you have any further questions.